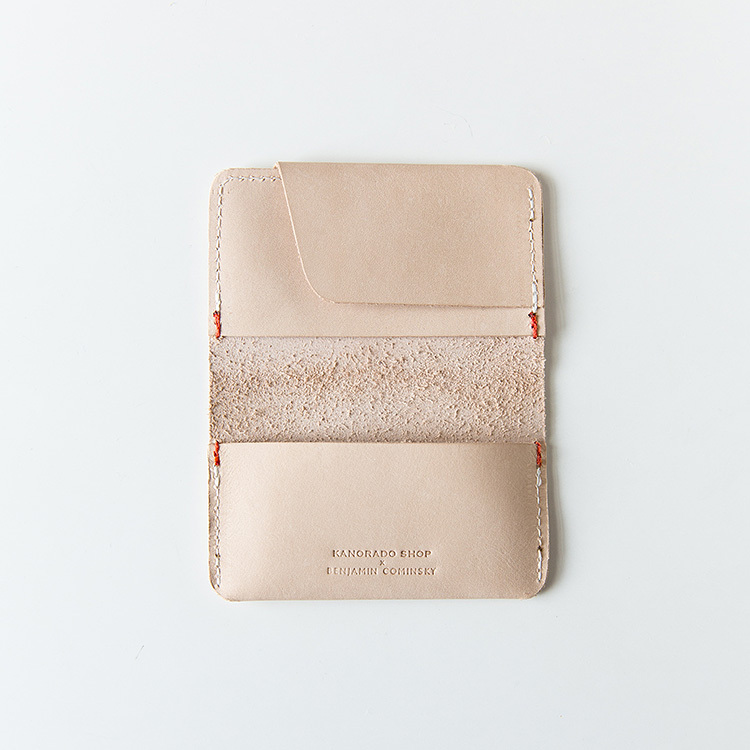 The kind folks (Asumi and Kuni) at Kanorado Shop, a Brooklyn-based online store that carries items they love – from their own products all made in New York and one-of-a-kind vintage items – are offering two of my readers this beautiful leather card case. I absolutely love this color of leather and it is incredibly soft to the touch. They generously gifted me one too and I love that I now don't have to burden my normal wallet with all my coffee shop loyalty cards (hah) which I would never remember to bring before. Glad to have easy access to my Metrocard as well! To enter, please leave a comment and a way to contact you (email preferably). Apologies to my international readers that this giveaway is open to U.S. residents only. I will choose two winners randomly next Monday (8/26) at 11AM. I hope you'll check out the other goodies on their shop as well. Happy browsing! UPDATE: The giveaway is now closed. Congrats to commenters #52 and #162, Sharon and Kamile. I have emailed you for mailing address details. Thank you to everyone who entered! I've never carried a card case before, but I've recently been considering doing so, as I have a couple of smaller purses that don't fit my (rather large) wallet. I will definitely be checking out their shop, too! I'm a sucker for cute little leather card holders. Love that hint of red stitching. That little detail adds so much to the overall look of the card case. Seems like a high quality product that would last for a long time, too. Definitely going to check out their shop. Such a beautiful bone color! It looks like such a pretty online shop. 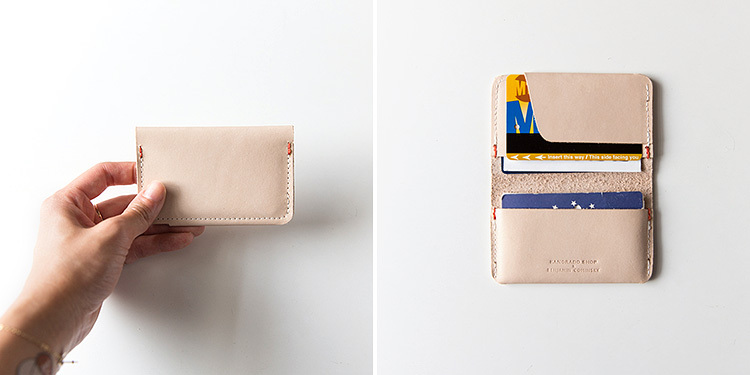 I love the light color of that little wallet. This would be a beautiful alternative to the overstuffed card case I'm currently carrying. Thanks for introducing us to this shop! (btw, hopefully this didn't go through twice - I had issues entering via mobile, so trying from desktop now). Ahh am I too late?? I soooooooo would want this!! Beautiful color. Love your pictures and blog. Thanks for giving us a glimpse into your life. That is a gorgeous card holder. I've always appreciated the lighter toned leathers. Excited to see the other items they have in store! Awesome! Love the simple design and color. Love the minimalist design! Birthday is coming up! I hope I win! Saw this contest through Alice Gao Photography fanpage. This leather card case is absolutely beautiful. Very upscale! I checked out the shop––they have such pretty items! I have the same exact problem with coffee loyalty cards. I see Stumptown! I love love love love love this!! This is a piece that I would use every single day! I hope this is my day of lucky! Thanks and Happy Monday to everyone! How lovely! Thanks for the opportunity. so pretty! got my fingers crossed! Very simple yet very chic. This is perfect seeing as I hate carrying around huge wallets in my bag! really lovely. really enjoy your blog! Hi Alice! I've admired your work for awhile now. Keep up the amazing creativity! Your photography never fails to amaze! This pinkish beige is an AMAZING color. I love it. Love the leather color as well!! this is gorgeous! I would LOVE to win one!! Can't wait to check out this store! It's a beautiful leather piece. love the wallet! it's the perfect color! I've been searching for the perfect card case, and this may be it! My Metrocard, school ID, and license are waiting for a new home! Ohgoodness this card case is gorgeous! This is actually so simple that it's perfect. Perfect for the school ID and my coffee cards. Heh. Their store looks great too! Thanks for promoting it. I just moved to the city and I've been looking for a card case exactly like this one! It's perfect. I love the color and I can use it to store my clipper card and ID. As a new driver, I desperately need to get organised, and this lovely thing seems perfect! A touch of sophistication marked with a little order for daily life! I would love to win this for the hubs! Thank you for a beautiful and handcrafted giveaway! The shade of leather is just so pretty! What a great giveaway! I also love their leather trays, perfect for holding jewelry! What a beautiful piece of leather -- the stitching is divine! Definitely need something like this. As a frequent commuter living in the Bay Area, this is exactly what I've been looking for! I agree Alice...it's the perfect little card holder...and the colour, AH..mazing. I also love the shops aprons/table linens/napkins...SWOON! Hello from a fan in Washington, D.C.! i've been a silently passive follower for a while now- but this is beautiful enough to draw me out! Love the color and simplicity! I hope this contest is still open. I'd like that cute wallet! I LOVE this cardholder for my husband and would definitely engrave it. "you are my everything & I am your thunder." Such a classic card case! Gorgeous! I love that raw leather look!!! Wonderful giveaway. The color is stunning! Elegant and understated- I love it! love how simple and delicate it looks! Looks great. I bet it's soft. Nice touch with the red stitching! Cool product. oh I love Brooklyn-based goods. This looks great! While looking at Vol.3 of C|E|R|E|A|L I stumbled upon your work, and as a result, now your blog. 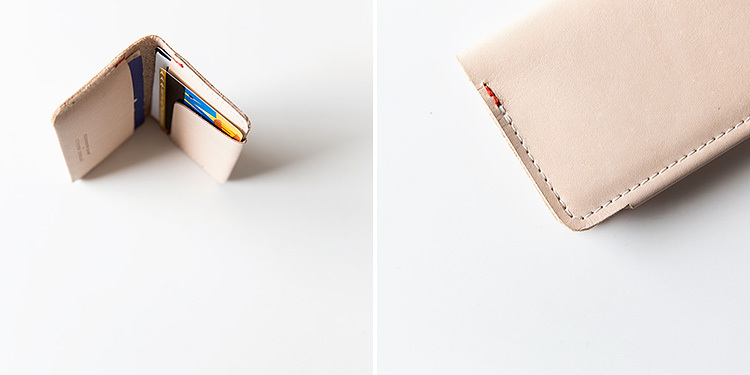 Lovely work Alice, and thanks for the opportunity to win this equally lovely wallet from the Kanorado Shop. I can be contacted at whouseworth@gmail.com. This is exactly what I've been looking for! I'm checking out the shop. Thank you. In love. Has this aesthetic feeling. Gorgeous, would love to have it! So, so lovely. Their site is equally as gorgeous. Lovely! photomelissa [at] gmail [dot] com. Gah!! LOVE it. So glad I discovered this post via twitter. Would love to win. kirsten [at] kirstenalana [dot] com! Trade forex, while this point is often neglected by beginners, it is impossible to overemphasize the importance of the choice of broker. That a fake or unreliable broker invalidates all the gains acquired through hard work and study is obvious. But it is equally important that your expertise level, and trading goals match the details of the offer made by the broker. What kind of client profile does the forex broker aim at reaching? Does the trading software suit your expectations? How efficient is customer service? All these must be carefully scrutinized before even beginning to consider the intricacies of trading itself. Capital One Forex through its various account levels cater to all types of traders and can give you a custom made trading deal to suite your trading needs.